A leading voice in the Senate has launched his latest salvo in an often lonely war against online casino gaming. As with his previous efforts, this opposition lacks foresight, and is tangled in the bidding of a biased benefactor. 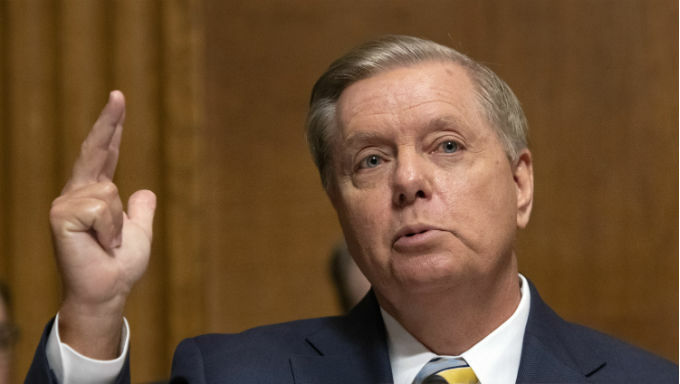 Republican South Carolina Sen. Lindsey Graham told Gambling Compliance he plans to use the upcoming confirmation hearing of Attorney General nominee William Barr as the latest push in his venture against online gambling. He hopes to press Barr on his views on the 1961 Wire act, which the Kennedy Administration passed as an anti-racketeering measure to combat organized crime. Though passed before the earliest forbearers of the internet, the act was interpreted until 2011 as a means to prohibit online casino gaming. That year, Justice Department officials rescinded the internet-based portion of the ban, which eventually allowed states to determine the games’ legality within their own jurisdictions. Since then, Pennsylvania, Delaware and New Jersey passed such laws, with several other states considering similar measures. Those moves, as well as all other gambling-related measures, received little pushback from the senior senator from South Carolina, who was first elected to his seat in 2003. That inaction lasted until 2014, when Graham first introduced a federal bill to ban online gaming. The bill failed, but Graham has year after year supported reinstating the ban. Graham remained largely ambivalent to the Supreme Court decision to strike down the federal ban on sports betting. He has not publicly joined Capitol Hill leaders supporting federal-level legislation since the ban was rescinded. Conversely, he’s remained steadfast in opposition to online casino games. Why the opposition to this form of gaming? In short, money. More specifically, the money from an infamous casino owner who loathes the thought of online gaming. Casino magnate Sheldon Adelson has for decades expanded one of the world’s largest gambling empires. His primary focus now is to prevent one facet of gaming that would allow others to do the same. His opinion isn’t shared by MGM and Caesars, his two biggest corporate rivals, both of which believe regulated, responsible online casino gaming presents little threats to society and can bolster the entire industry. His postulations, and influence, have in large part dissuaded his home state of Nevada from passing online casino gaming despite the state’s nearly ubiquitous embrace of legal gambling. Congressional Republicans, which have controlled the House of Representatives since 2011 and the Senate since 2015, have likewise opposed federal restrictions, instead allowing states to decide. But there have been exceptions, Graham most noticeable among them. Adelson became somewhat of a political kingmaker earlier this decade, contributing millions of dollars to campaigns. He is widely credited with single-handedly keeping alive the presidential campaign of former Republican House Speaker Newt Gingrich with a multi-million dollar contribution in 2012. In the 2016 cycle, another GOP hopeful sought Adelson’s blessing – and a portion of his vast resources. Graham introduced his anti-gambling bill about a year before he announced his run for president. Multiple media reports in the following years tied support for the bill in part to thousands of dollars in fundraising efforts on the senator’s behalf, organized by Adelson. Trailing in the polls in 2015, the Post reports Graham pleaded for Adelson’s financial lifeline a la his former House colleague. That didn’t come, and Adelson eventual funneled support for his acquaintance in the casino industry, Donald Trump. Still, Graham faces another re-election for his Senate seat in 2020. A wealthy, self-interested benefactor would likely assist him, assuming said benefactor can achieve his most coveted objective. With Congress unlikely to take up a federal online casino ban, Graham has taken aim at the Justice Department. The likely next chair of the influential Judiciary Committee, Graham has the unique ability to direct the high-profile, public confirmation hearing of the attorney general nominee. While Barr, who previously held that under the first Bush administration, will likely receive a less dramatic hearing than other recent nominees to prominent posts, the nature of the process nevertheless allows committee leaders like Graham to shape proceedings to their preferences. Graham made it clear this week that will include positions on online gaming. When multiple written appeals to former Attorney General Jeff Sessions and later Deputy Attorney General Rod Rosenstein went unanswered last year, Graham now sees the new head of the Justice Department as his best shot to achieve his, or more accurately Adelson’s, long-desired change to online gaming laws. He is now joined in opposition to online gaming by Democratic Sen. Diane Feinstein, the ranking member of the Judiciary Committee and a political opposite of Adelson. Along with Graham, who has never sent an email, Feinstein, 85, represents an older generation of lawmakers less attuned to the realities of the internet. Online gaming opponents spread fears that mobile gambling will lead to widespread corruption and bankrupt players. In reality, online casinos have verifiable age restrictions and regulations. Geofencing technology allows locals to restrict or offer games even at a county-by-county level, as is the case for Louisiana daily fantasy games. State regulators are also involved in regulations and implementation. New Jersey and Delaware have had the games. Along with Nevada, these states also offer online poker, with Pennsylvania set to offer both gaming avenues shortly. None have reported, or project, any noteworthy demise in their respective moral fabrics. In the meantime, online gaming has sparked hundreds of millions of dollars in bets, of which a portion of casino winnings have returned to the states in the form of taxes. Ironically, Adelson could benefit from online gaming in Pennsylvania, where he owns the Sands Casino Resort Bethlehem, as well as Nevada, where he owns multiple properties. Instead, one man’s quest against what he erroneously fears as a threat to his multi-billion personal empire will continue. As long as the money keeps flowing, Adelson will assuredly have politicians to take up his legislative aims. When a beneficiary like Graham challenges the nominee for the nation’s top law enforcement officer on his views on online casino gaming, it will be in large part as a means to placate a casino owner who opposes them – to his own expense, and that of others.